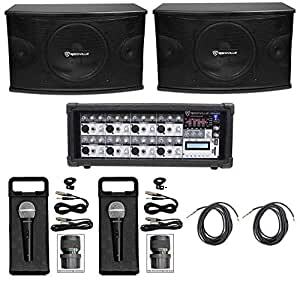 Package Includes : Pair of Rockville KPS10 10″ 3-Way 1200 Watt Karaoke Speakers with Wall Brackets and MDF Enclosure + Rockville RPM85 2400 Watt Powered Mixer with 8 Channels, Bluetooth, 5 Band EQ, and Effects + (2) Rockville RMC-XLR High-End Metal DJ Handheld Wired Microphone Mic w (2) Cables + XLR Cable and Mic Clip + (2) Rockville RTSBW20 20 Foot 1/4″ TS to Bare Wire Speaker Cable, 16 AWG, 100% Copper! Pair Rockville KPS10 10″ 3-Way 1200 Watt Karaoke Speakers with Wall Brackets and MDF Enclosure. Peak Power: 2400 Watts Per Pair (1200 Watts Each). Program power: 1200 Watts Per Pair (600 Watts Each). RMS Power: 600 Watts Per Pair (300 Watts Each). 3-Way Speaker With Built-In 3-Way Crossover For Amazing Sound!. 10â Low Frequency Woofer With 1.37â, 100% Copper Voice Coil and 74 oz. Ferrite Magnet. 3.85â High Frequency Tweeter With 7 oz. Rockville RPM85 2400w Powered 8 Channel Mixer, USB, 5 Band EQ, Effects/Bluetooth. RMS Power Output: …..300w x 2 @ 4 Ohm. …..225w x 2 @ 8 Ohm. …..600w x 1 @ 8 Ohm. Program Power Output: …..600w x 2 @ 4 Ohm. …..450w x 2 @ 8 Ohm. …..1200w x 1 @ 8 Ohm. Peak Power Output: …..1200w x 2 @ 4 Ohm. …..900w x 2 @ 8 Ohm. …..2400w x 1 @ 8 Ohm. Individual Volume, Reverb, Bass, and Treble controls. Adjustable effects: volume, echo, and delay. Built in bluetooth playback. Rockville RMC-XLR High-End Metal Handheld Wired Microphone Mic Amazing Sound!. Mic Features: M-56 Cartridge. Full metal mic body. Type: dynamic . Neodymium magnet. Polar Pattern: uni-directional. Frequency Response: 80 – 13Khz. Impedance: 600 Ohms Â± 30%. Sensitivity: -72 Â± 3dB. Case Features: High quality plastic carry case protects the mic during transportation. Comfortably holds microphone and mic cable . Cable Features: XLR to Â¼â Cable. XLR to XLR Cable . Package: Pair of Rockville KPS10 10″ 3-Way 1200 Watt Karaoke Speakers with Wall Brackets and MDF Enclosure + Rockville RPM85 2400 Watt Powered Mixer with 8 Channels, Bluetooth, 5 Band EQ, and Effects + (2) Rockville RMC-XLR High-End Metal DJ Handheld Wired Microphone Mic w (2) Cables + XLR Cable and Mic Clip + (2) Rockville RTSBW20 20 Foot 1/4″ TS to Bare Wire Speaker Cable, 16 AWG, 100% Copper!